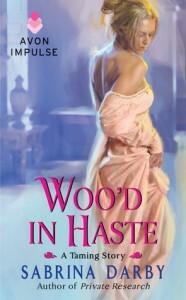 Woo'd In Haste is the first book of the Taming Series by Sabrina Darby and is a retelling of William Shakespeare's The Taming of the Shrew. This is a longish novella about 150 pages and it read like a novella. Woo'd In Haste tells the story of Miss Bianca Mansfield and Lucien Dorlingsley, Viscount Asquith and how they "fell" in love. This is the first book that I read by Sabrina Darby. Unfortunately, I didn't really enjoy it as much. Maybe owing to the "live at first sight" trope. Now, don't get me wrong, I do love a good "love at first sight" story but this was not it. Luc's character just rubbed me the wrong way and I felt that he wasn't a man but a boy acting to get this girl. He felt too good, too nice to be someone that Bianca would fall in love with. I did like how Bianca changed throughout the story. Initially, we meet her as meek and accepting in her current situation. While her older sister, Kate, is out in London on her second season, she is stuck in the country with her former governess, younger half-brother and a father that didn't have any power at all. This struck me as odd. I did not like that that father allowed Kate to dictate his decisions, especially when she said that Bianca had to hold off her season until SHE gets married first. All in all it is an okay read but it was not for me. I have the next book Wed at Leisure which is Kate's story. I have a feeling that it is going to be better.